Exciting events are happening this month, and it started yesterday. Last night I attended the premiere for the movie Ghana must go, and today I’d be speaking at the Naija Hair can grow salon day out with other awesome panelists. It’s happening today Sunday, 5th June, 2016 at the Red carpet hall Oniru, V.I Lagos. 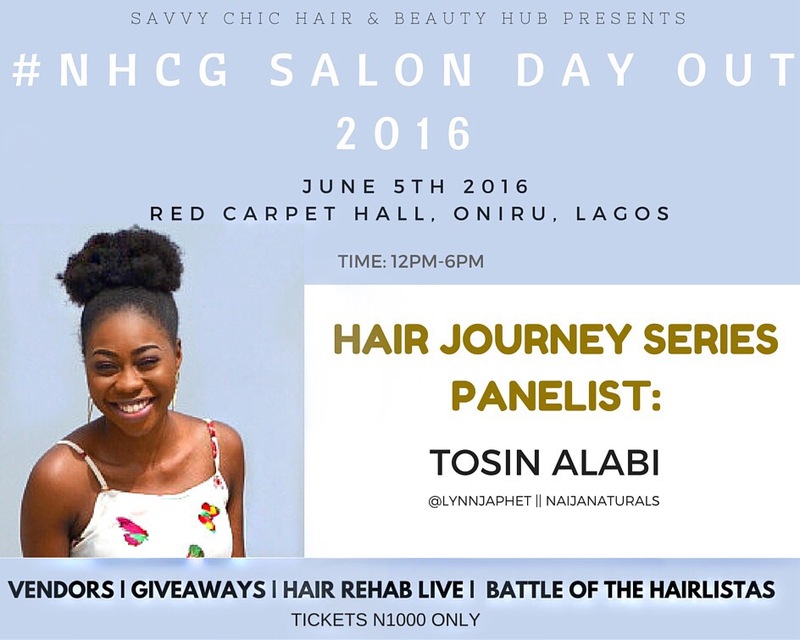 This is an annual event hosted by Dabs of Naija Hair Can Grow, and Savvy & Chic Hair and Beauty Hub. 2:00pm to 2:30pm: ‘The Nigerian Hairlista’s Evolution- Using Nigerian Products to Grow Your Hair and the Naira’. This is a hairstyling competition. I’m really looking forward to see you all today! So get ready to shop, network and LEARN! Tickets are 1,000 Naira only. Venue: The Red Carpet Hall, Oniru. It’s on the street of Four Points Sheraton Hotel, just drive straight down. The hall is on the left, after The Incubator.Call 08090613325 for directions. ← THE BELIEVER’S CALL: NOW YOU’RE SAVED WHAT NEXT? Wish I could attend this.